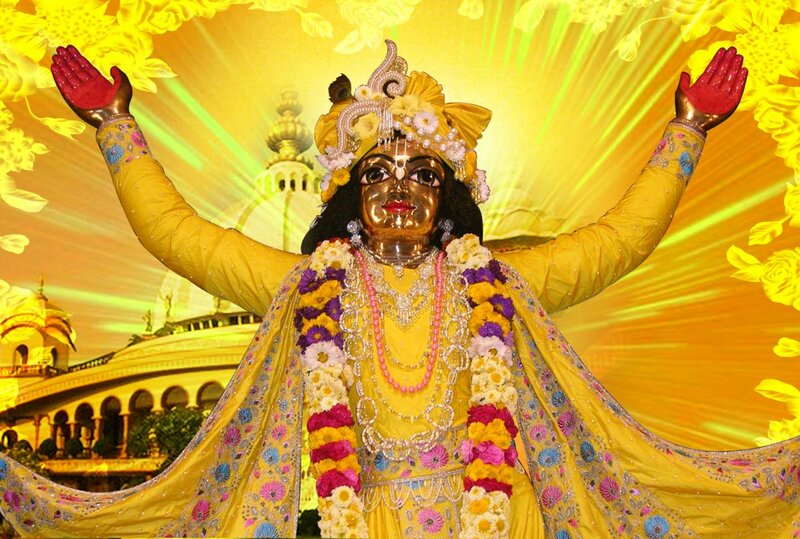 Today we celebrate the appearance day of Sri Caitanya Mahaprabhu. 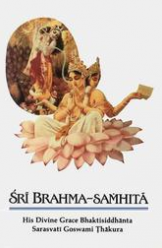 We honor His appearance with these two select verses from the Sri Caitanya-caritmrta. 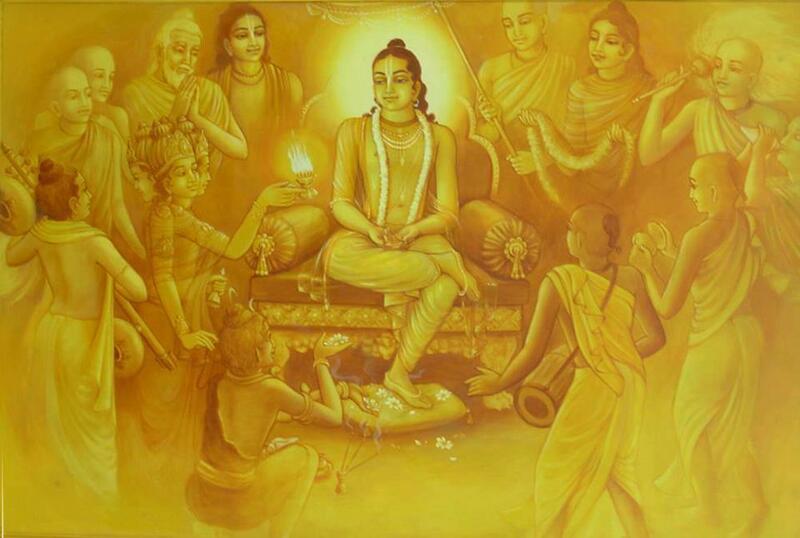 “O most munificent incarnation! You are Kṛṣṇa Himself appearing as Śrī Kṛṣṇa Caitanya Mahāprabhu. You have assumed the golden color of Śrīmatī Rādhārāṇī, and You are widely distributing pure love of Kṛṣṇa. We offer our respectful obeisances unto You. So today is Lord Sri Caitanya Mahaprabhu’s appearance day. We will honor it with a full day fast, which we will break at the appearance of the full moon with a nice prasadam feast. Also in honor of this auspiscious day, we share with you a lecture given in Mayapur India, on the Gaura Purnima day, in 1976. Hare Krishna! So here is a very specific statement about Śrī Caitanya Mahāprabhu, who is avatāra. Caitanya Mahāprabhu is the same Supreme Personality of Godhead, but He’s channa. Channa means covered, not directly, because He has appeared as a devotee. Avatāra… Rūpa Gosvāmī has found out that He’s avatāra of Kṛṣṇa. All the devotees, Sārvabhauma Bhaṭṭācārya, Rūpa Gosvāmī, and in the śāstra, and the Upaniṣad, Mahābhārata, in every… Sādhu-śāstra. Avatāra should be confirmed by great devotees, personalities, and must be collaborated with the statement in the śāstra. 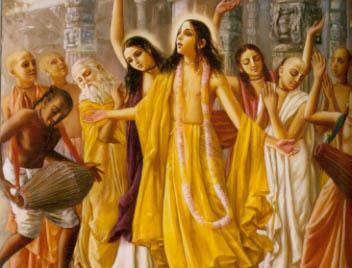 So tomorrow is Gaura Purnima, the appearance day of Lord Sri Caitanya Mahaprabhu. We will honor this auspicious and most important day, with an all day fast, followed by chanting, dancing, and feasting. 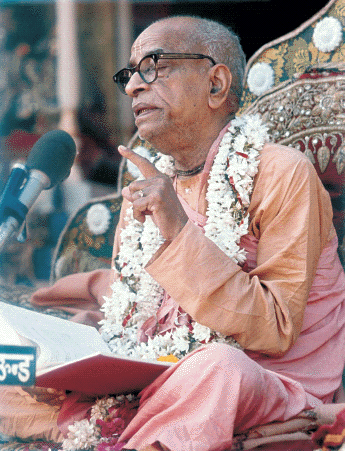 Today we are posting a famous lecture given by Srila Prabhupada on Gaura-purnima in Mayapur, back in 1976. …So Śrī Kṛṣṇa Caitanya is Kṛṣṇa. It is confirmed by the śāstras. Here it is said, channaḥ kalau yad abhava. In the Kali-yuga, directly He does not appear as the incarnation like Nṛsiṁhadeva or Vāmanadeva or Lord Rāmacandra, yes, but as devotee. 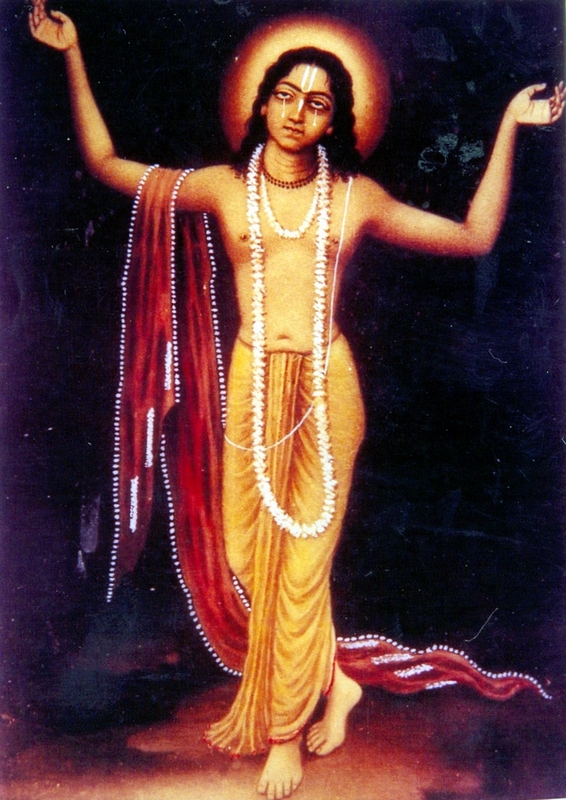 So He’s the same incarnation, Lord Caitanya Mahāprabhu. Abhavat. “Therefore sometimes You are called as tri-yuga.” There are four yugas, but He is known… Because in three yugas He appears distinctly, and in the fourth yuga, the Kali-yuga, as devotee, therefore He’s called tri-yuga. Lord Sri Caitanya Mahaprabhu is Krishna Himself, and He is teaching how to develop love of God by a very simple method…chanting the names of the Lord. Only five hundred years ago Lord Caitanya Mahāprabhu, prophesied that the Hare Kṛṣṇa mantra would resound throughout every town and village in the world. At a time when Western man was directing his exploratory spirit toward studying the physical universe and circumnavigating the globe, in India Śrī Caitanya was inaugurating and masterminding a revolution directed inward. His movement swept the subcontinent, gained millions of followers, and profoundly influenced the future of religious and philosophical thinking, both in India and the West. In the following talk, presented in November 1969 at London’s Conway Hall, Śrīla Prabhupāda describes the divine appearance of Śrī Caitanya. Śrī Caitanya Mahāprabhu, the golden avatāra, appeared in India nearly five hundred years ago. It is the custom in India that when a child is born, an astrologer is called for. When Lord Kṛṣṇa, the Supreme Personality of Godhead, appeared five thousand years ago, Gargamuni was called by His father, and he said, “This child formerly incarnated in three complexions, such as red and golden, and now He has appeared in blackish color.” Kṛṣṇa’s color is described in the scriptures as blackish, just like the color of a cloud. Lord Caitanya is understood to be Kṛṣṇa appearing in golden complexion. There is much evidence in Vedic literature that Caitanya Mahāprabhu is an incarnation of Kṛṣṇa, and this is confirmed by scholars and devotees. In the Śrīmad-Bhāgavatam it is confirmed that the incarnation of Kṛṣṇa, or God, in this present age, Kali-yuga, will always engage in describing Kṛṣṇa. He is Kṛṣṇa, but as a devotee of Kṛṣṇa He describes Himself. And in this age His bodily complexion will not be blackish. This means that it may be white, it may be red, or it may be yellow, because these four colors—white, red, yellow, and black—are the colors assumed by the incarnations for the different ages. Therefore, since the red, white, and blackish colors were already taken by former incarnations, the remaining color, golden, is assumed by Caitanya Mahāprabhu. His complexion is not blackish, but He is Kṛṣṇa. Lord Śrī Caitanya Mahāprabhu, the great apostle of love of God and the father of the congregational chanting of the holy name of the Lord, advented Himself at Śrīdhāma Māyāpura, a quarter in the city of Navadvīpa in Bengal, on the Phālgunī Pūrṇimā evening in the year 1407 Śakābda (corresponding to February 1486 by the Christian calendar).